Ronald Reagan’s Vice President, George H.W. Bush, won the election of 1988 and became President of the USA. From the late 1940s to the late 1980s, the vast majority of America’s military strategy was to focus on ensuring the spread of Communism, and the nation of the USSR in particular, did not harm American interests around the world. The Soviet Union began to break apart in the late 1980s. In December of 1991, Russia declared that the Soviet Union had officially broken apart. The areas controlled by Russia began to be independent nations. Russia itself embraced Democracy as is its form of government. Mikhail Gorbachev stepped down as leader of the USSR and Boris Yeltsin rose to be Russia’s President. 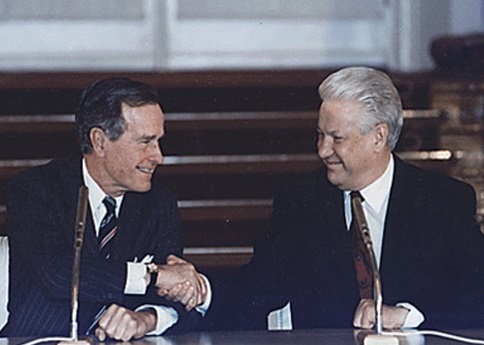 In 1992, President Bush and President Yeltsin signed an agreement officially declaring the Cold War was over. Many were encouraged by this new relationship between the USA and the USSR. The USA emerged as the undisputed superpower in the world. This meant America was positioned to take a leading role in the world within a variety of political dealings. Although the tension between the USA and Russia reduced dramatically in the late 1980s and early 1990s, many other conflicts abounded in the world. The USA had to restructure its approach and the focus of its military to address the variety of conflicts occurring in numerous nations. As the USSR declined, many Chinese citizens wanted more Democratic reforms as well. In 1989, in Beijing’s Tiananmen Square, college students led marches against the government. China’s leader, Li Peng, ordered the military to end the protests. The nations of the world watched on CNN as the military attacked the students. After the event, it was clear China was going to remain Communist, despite their small changes. President George H.W. Bush harshly critiqued China’s actions. However, he continued a relationship with China after the incident. When the USSR broke apart, it brought instability to the nations in the former Soviet Union and in the Satellite Nations of Eastern Europe. Yugoslavia, which was a declared Socialist Nation, also saw massive tension in the late 1980s and early 1990s. Ethnic tensions led to various ethnic groups claiming territory in Yugoslavia. The Serbs were the most populace people group. As the various ethnic groups sought independence from the Serbs, the Serbs tried to maintain control of the other ethnic regions. A leader named Slobodan Milosevic tried to establish a government in which each citizen had one vote. Yet, many argued this would allow the Serbs to dominate politics. Slovenia and Croatia tried to establish Republics with less ties to the entire nation. The Serbs in Slovenia and Croatia tried to rebel and supported Milosevic’s plan. Various ethnic conflicts led the area into a horrific Civil War. Managing the fall of Communism in various nations created a problem for the world. Instability in these areas could impact the nations of the West. Initially, President George H.W. Bush was hesitant to get involved with the conflict in Yugoslavia. He felt that the USA would get tangled in various ethnic fights that did not have a clear solution. By 1992, the USA and members of the United Nations did get involved in the conflict. They tried to intervene in Bosnia between the ethnic fights of the Serbs and Bosnians. By then, over 100,000 people had died in the ethnic conflicts. Milosevic was later convicted of war crimes. In South Africa, segregation between Whites and native Africans still persisted all the way until 1990. This wicked system of segregation was called apartheid. A South African leader, Nelson Mandela, opposed apartheid and asserted it was an immoral system. He went to jail in 1962 for his protests. Many American businesses stopped trading with South Africa to protest apartheid. Congress also began to restrict trade with the area in protest. President George H.W. Bush met with Mandela, who was released from prison in 1990. Mandela led South Africa to end apartheid and establish Democracy for all South African citizens. Mandela served as President of South Africa from 1990 to 1999. In August of 1990, Iraq, a nation in the Middle East, led by a dictator, Saddam Hussein, invaded the neighboring country of Kuwait. This started The Gulf War. Iraq had accumulated a great deal of debt in its war with Iran. The goal of Iraq was to takeover Kuwait’s oil fields to gain wealth off of oil profits. If Hussein succeeded, he would control a massive section of the oil industry, which impacted all industrial nations. The USA feared Hussein would also try to invade Saudi Arabia to control their oil fields as well. President George H.W. 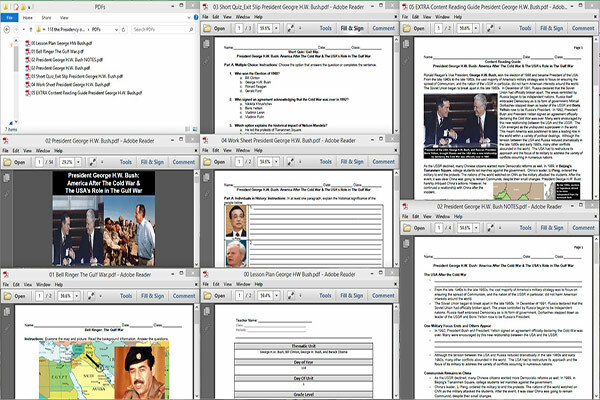 Bush quickly opposed the military invasion of Kuwait and began forming a coalition to fight against Hussein and push him out of Kuwait. President George H.W. Bush formed an alliance that included Egypt, Britain, Saudi Arabia, France, and others. The United Nations also insisted that Iraq leave Kuwait. Hussein refused. Hundreds of thousands of soldiers were involved in this alliance, including nearly half a million American soldiers. The alliance initiated aerial attacks against Iraq’s strongholds in Kuwait in January of 1991. General Colin Powell and General Norman Schwarzkopf managed the attacks. In February of 1991, the coalition forces invaded Kuwait and removed Iraq’s troops from the nation. Iraq had lost The Gulf War. America had led the coalition to a decisive victory and protected Kuwait. They did not invade Iraq, however, and Saddam Hussein stayed in power. After The Gulf War ended, President George H.W. Bush experienced a surge in popularity in 1991. It seemed inevitable that he would be elected to a second term. However, the economy entered into a downturn in the early 1990s. This led to a recession and many people wanted to see the economy change. Bush also had to raise taxes, something he said he would never do in his campaign. Although he experienced a surge in popularity following the Gulf War, Bush was not able to achieve victory in the Election of 1992. He was defeated by a Democrat, Bill Clinton.